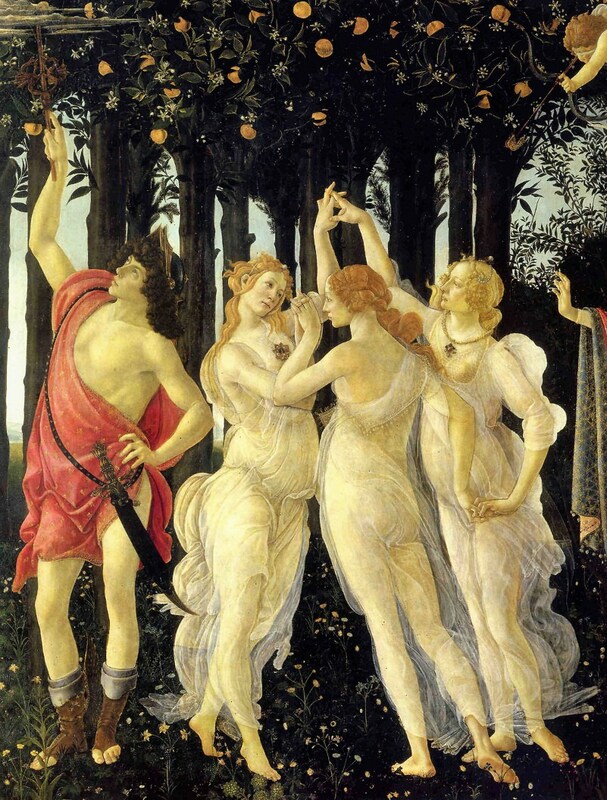 The "Primavera" is one of a series of mythological works executed by Botticelli after his return from Rome in 1482, it is one of Botticelli's best known and most discussed paintings. Its exact meaning has been debated and pondered over for many years but it is doubtful if anyone fully understands the puzzling message behind this stunning masterpiece. It was once thought that the picture was commissioned by Lorenzo the Magnificent, who was the head of the powerful Medici family at the time. We now know that it was actually in the possession of Lorenzo di Pierfrancesco de' Medici who was a cousin of Lorenzo the Magnificent. The picture was hung above the backrest to a sofa in an anteroom of the bedchamber of Pierfrancesco’s Florentine palace. "Pallas and the Centaur", another of Botticelli’s paintings hung in the same room. Primavera was probably painted as a celebration of Pierfrancesco’s marriage in 1482 and this important member of the Medici became a faithful patron of Botticelli's work. The painting is set in an orange grove on a meadow of flowers, it contains eight adult figures placed along the length of the picture. The orange trees stand erect but above the head of Venus, they bend to form an arch framing the Goddess. Another tree on the far right bends echoing the body shapes of Zephyrus, God of Winds and the nymph Chloris. The picture celebrates the arrival of spring and is filled with mythological symbolism. Venus, Goddess of Love, is in the centre of the orange grove, on her left Flora, Goddess of Flowers and Spring, appears clad in garlands of flowers. Next to Flora is the nymph Chloris, she is pursued by Zephyrus, God of Wind, who has a burning passion for her. 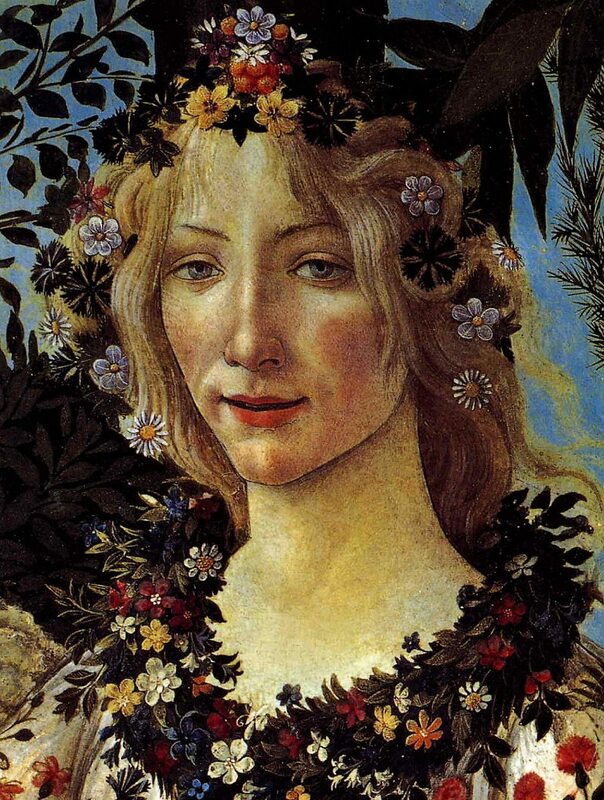 The Roman poet Ovid describes Chloris as transforming into Flora, Goddess of Flowers, "Once I was Chloris, who am now called Flora" and so symbolising the beginning of spring. 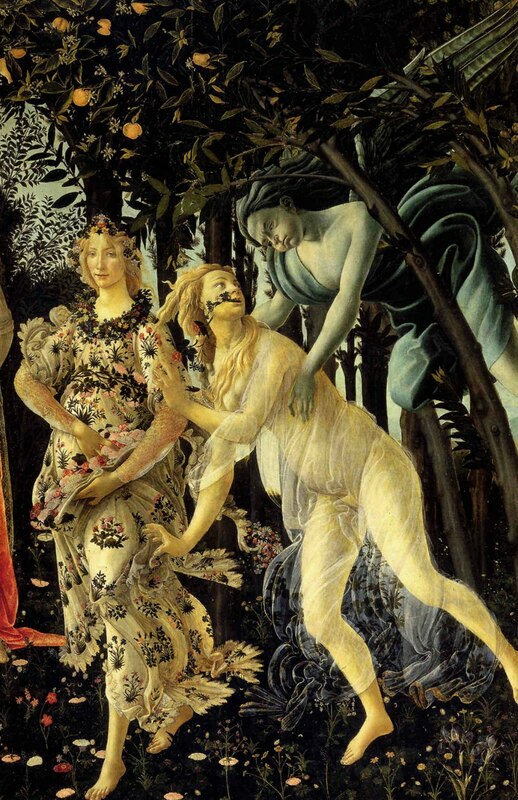 Botticelli has placed both figures side by side within the same painting. On the right of Venus are The three Graces, female companions of the Love Goddess who perform their dance at the onset of spring. Next to the Graces stands Mercury, Messenger of the Gods, who inspects the orange grove and protects the garden from intruders. In Classical mythology Mercury has the winged shoes of the messenger and holds a staff in his right hand which he uses to separate two fighting snakes, the two snakes then wind themselves around the staff which is thereafter seen as a symbol of peace. In the Primavera Mercury uses the staff to drive away some clouds, therefore, maintaining the tranquillity within the garden. Floating overhead at the centre of the picture is Amor, the son of Venus, he is blindfolded as he shoots his arrows of love, their flaming tips certain to intensify the emotion of love in whoever they strike. The primary source for the picture comes from a poem, "De Rerum Natura", by the classical poet and philosopher Lucretius. 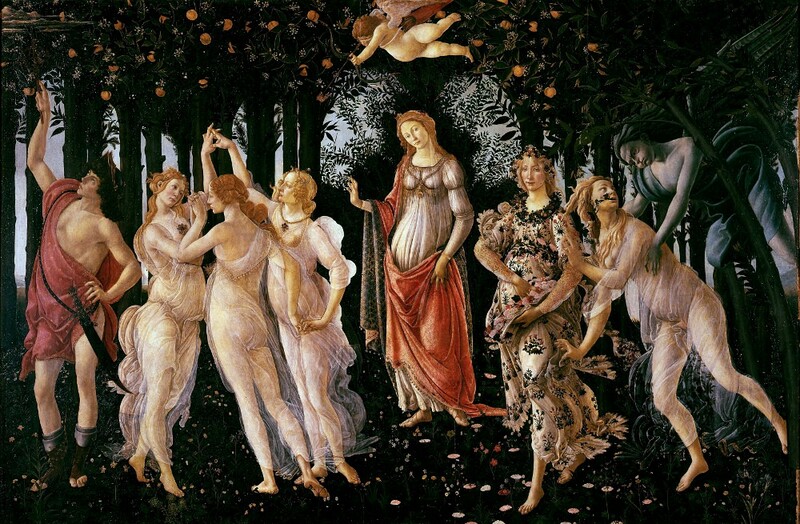 This and the "Fasti", Ovid's Roman calendar, provided the inspiration for Botticelli's Painting. These superbly drawn figures add to the charm and mystery of one of Botticelli's most complex and analysed paintings. Zephyrus and Chloris. (s) Detail. 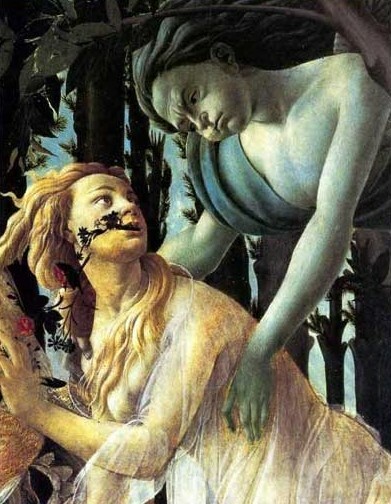 See how well Botticelli has captured the emotion on the face of the nymph Chloris as she is seized by Zephyrus, God of Winds, and begins her transformation into Flora, Goddess of Flowers.